I made a friend! It’s a big deal because since I moved to CA for a bit, I don’t have many in this neck of the woods. YOU are my friend. No, don’t look behind you, I’m talking to YOU. I have a very active cyber life. It’s how I cope. But the good news is that a professor of mine from college just sent me a new friend. He was my German professor and writing professor and he taught me a lot about culture in general… especially Viennese culture, which I fell in love with. He has a student now that is interested in food and she also happens to be from Berkeley. And he told her to get in touch with me when she came home this summer, and she did, and now we cook together from time to time, and she helps me with my technological crises that I have all the time occasionally. It’s thrilling. You know what else is thrilling? She brought me Meyer lemons from her lemon tree. For those of you who read my global citrus fruit appeal a few months ago, you know how much that means to me. 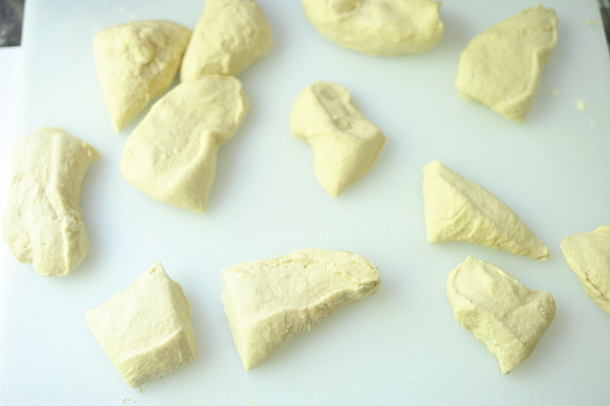 For our first recipe together, we made….can you guess? German Pretzels! In honor of our love of food and German things and her impending study abroad this fall in Germany and most importantly in honor of Professor Hansen. These are for you Professor Hansen! 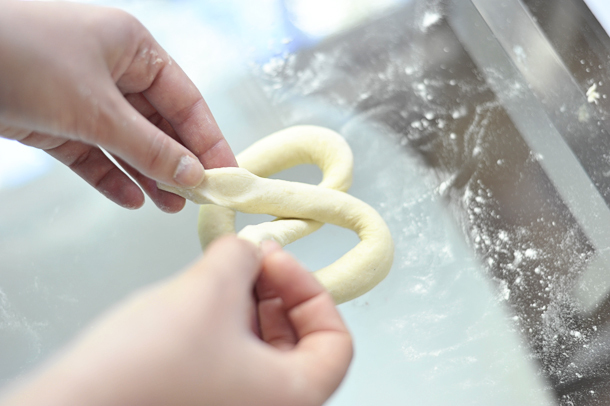 These are the key ingredients to a good German pretzel. I prefer lard to butter because it gives it a better mouth feel. (For more on my love of lard go here and here). And brown sugar because it’s earthy. 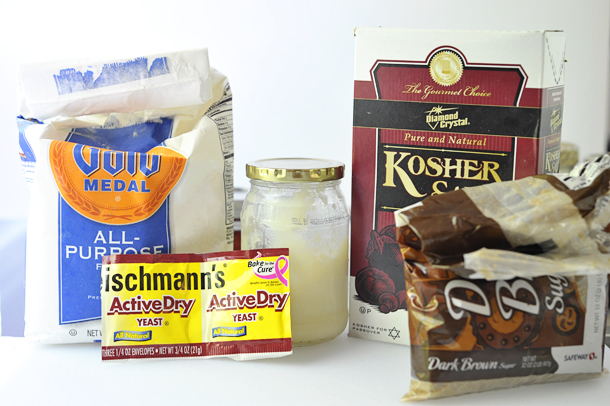 The yeast has to be dissolved in a bit of warm water until it bubbles and rises, then you can combine the flour, brown sugar, lard, and yeast in a bowl. 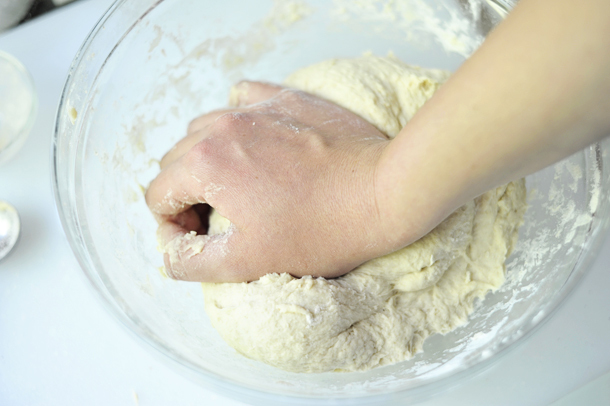 It is so wonderful having four hands, I can’t tell you how much less flour I get on my camera. She kneaded. For 8 minutes. Then we cut the dough into pieces and began to roll each one out. My new friend is a perfectionist and was a careful roller. Thank goodness because mine would have probably been a little wobbly had I done it alone. Then you let them sit in the refrigerator until they rise. They will get lovely and plump. NOW. The great debate. Many people like to use lye to make their pretzels because it gives it that brown uniform look and a crispy outer surface. The problem is that lye is pretty darn dangerous. A lot of the reading I did suggested I use eye goggles and gloves if I were going to use lye. 1. Because I like the skin on my fingers and didn’t want it to burn off. 2. Because I’m very messy in the kitchen and like to splash things around. 3. I don’t own goggles. So if you want to be really, truly authentic, use lye and proceed with caution. Or if you want to be a wimp like me use baking soda! You want to pour it into a shallow pan of water that is simmering. Let it bubble and dissolve. And let them cook for 30 seconds on the other side. Transfer them to a sheet tray. They will look like puckered old men. That’s good. 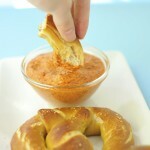 Then, if you can find pretzel salt, sprinkle it on generously. I used course sea salt because that’s what I could find. They were so incredible. They far surpassed my expectations. In fact I think they are my new favorite food. We sat outside and ate the whole tray. They were even more incredible with this German style mustard, which I’ll show you tomorrow! 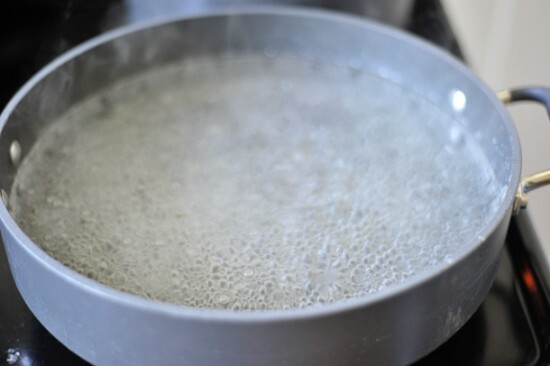 Dissolve the yeast in 1/4 cup warm water until it bubbles. 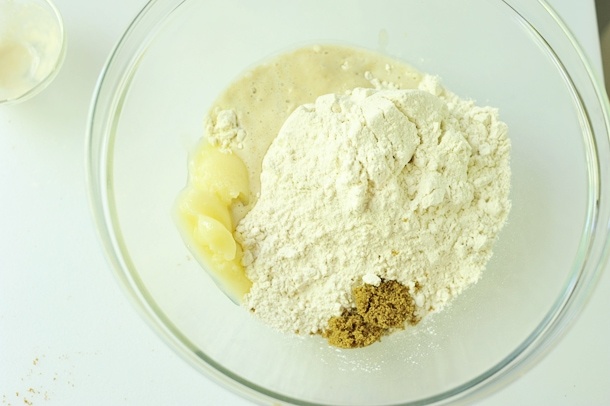 In a mixing bowl, mix together the brown sugar, lard, yeast, 1 2/3 cups warm water and half the flour. 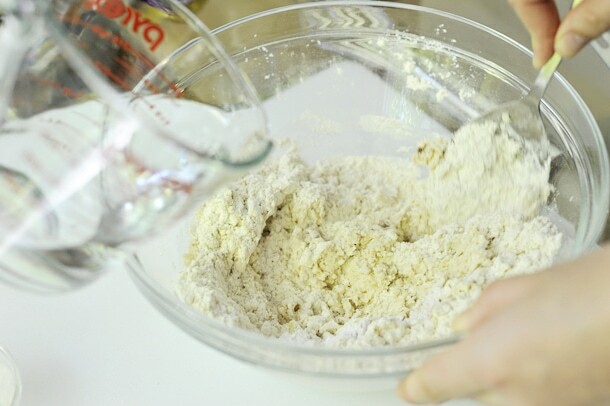 Add the kosher salt and remaining flour and stir just until mixture comes together in a shaggy mass. 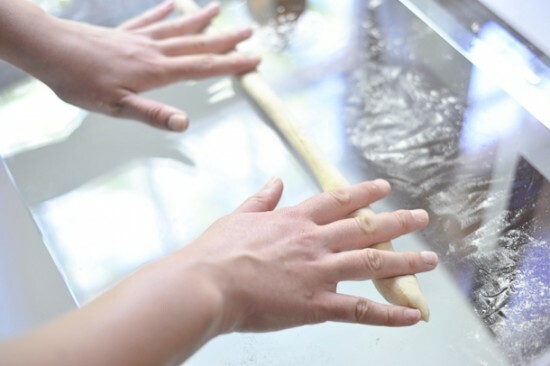 Turn out onto counter and knead for 8 to 10 minutes, until smooth and supple. Cut into 12 pieces and let rest 5 minutes. Roll out each piece into a rope about 22 inches long. 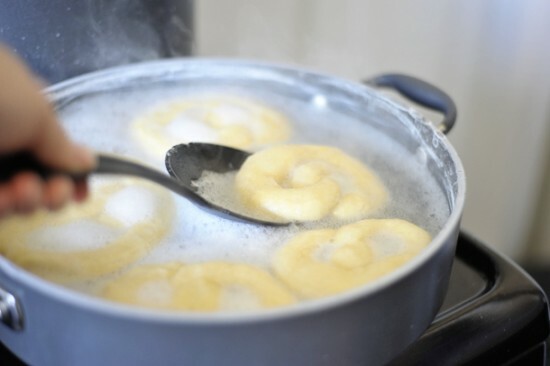 (For traditional shape, the ends should be thin and the center fat). 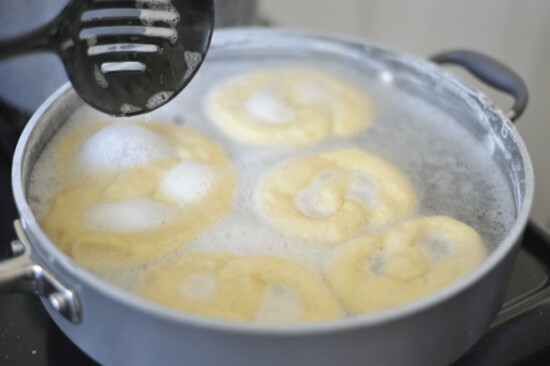 Lift both ends, twist them around each other once, then bring ends back and press them on either side of fat “belly,” at about 4 o’clock and 8 o’clock. 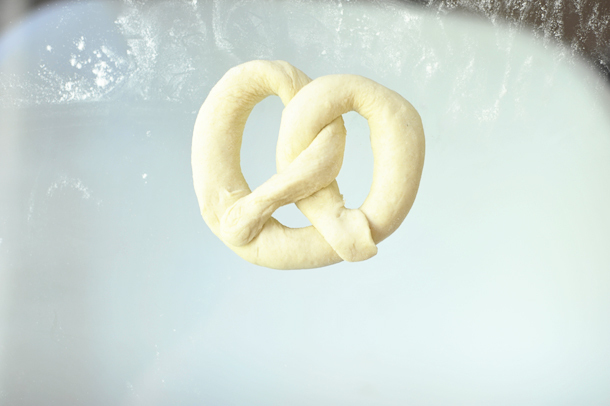 Then gently spread out “shoulders” of pretzel. 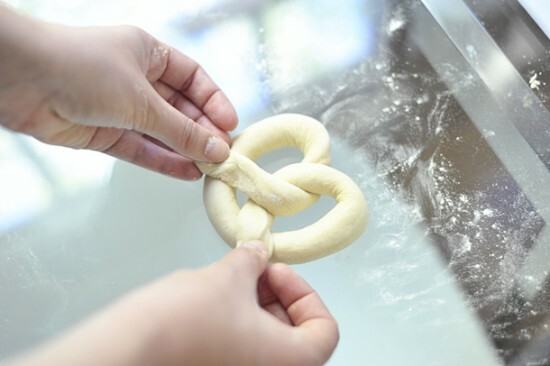 Transfer shaped pretzels to an un-greased baking sheet. Let rest at room temperature for 30 minutes, then refrigerate at least one hour or overnight. 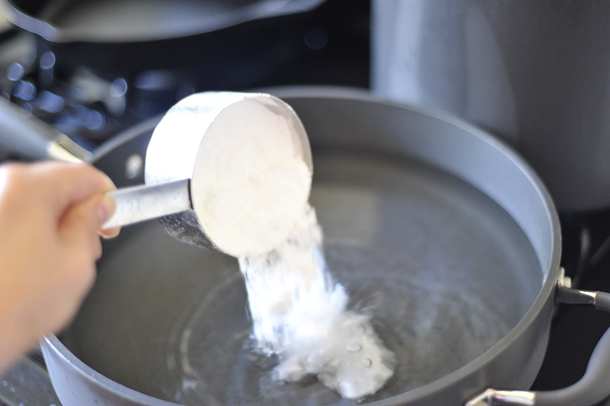 In a large, deep skillet, stir the baking soda into 2 quarts of water and bring to a simmer over high heat. Reduce the heat to moderate. 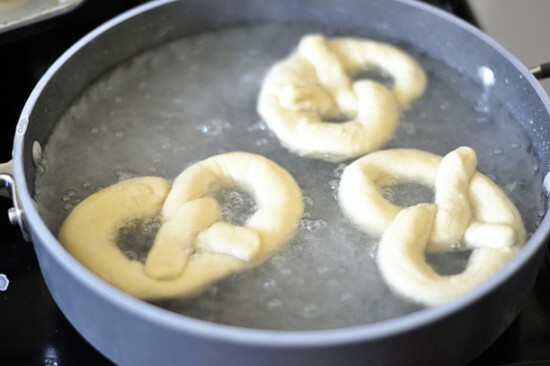 Using a slotted spoon, carefully transfer pretzels to the simmering water 30 seconds, turning once. Transfer the pretzels to a cutting board or rack to drain, then return them to the cookie sheets, spacing them evenly. 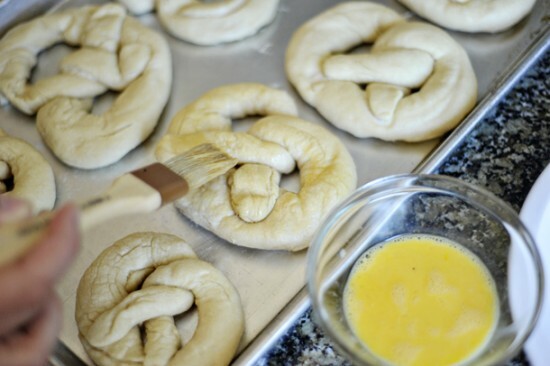 Brush with egg wash. Sprinkle pretzels with salt. Bake about 15 minutes or until deep brown. Remove to a rack and serve warm. These should really be eaten right away or at least the same day. To prepare in advance, complete steps 1-4 ahead of time and an hour before you'd like them, finish with steps 5-6. Thanks! I cannot wait to try these. This reminds me that I want to get my hands on some leaf lard so I can render it and have a supply on hand for things just like this! I've been going back and forth about whether to attempt the lye dip or not. I kind of want to do it, but not sure about a baking task that requires safety goggles! Hi Nicole… you can render your own lard you know! Here are two posts I did on it a while back: http://georgiap.webfactional.com/2010/02/23/recipes/h… AND http://georgiap.webfactional.com/2010/03/22/recipes/a…. 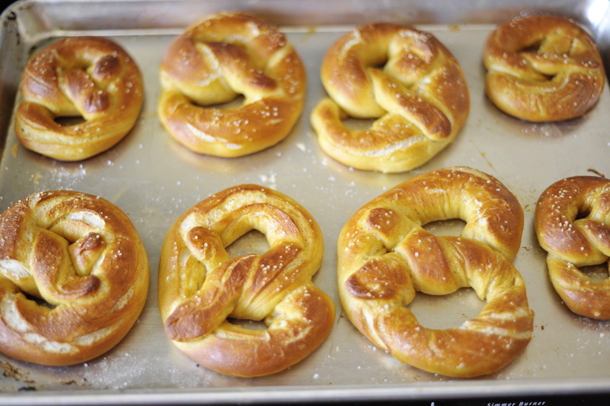 I used duck fat for these pretzels. Yummy! 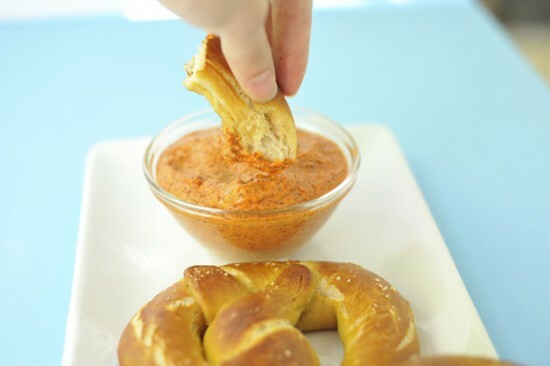 I love pretzels, and you make this look so easy. How would you suggest storing them if you don't plan to eat the whole tray? And how long would they keep? Thanks for another wonderful recipe! Ooh, yes. I meant to add that to the post. You should really eat them the same day or at minimum the next day. There not so wonderful after that. 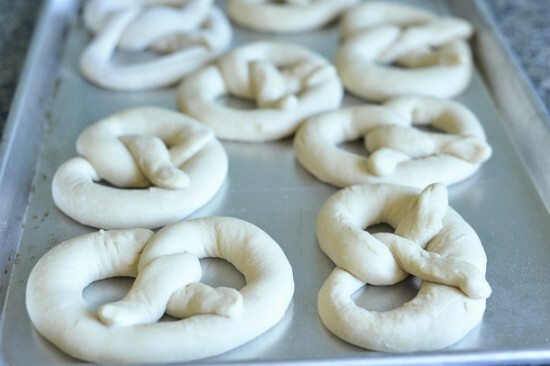 I've been looking for a pretzel recipe to try with Felix…thanks! We're going to try making them as a surprise for Andrew's first father's day. Ooh, I’m honored Christine! I only wish I could meet Felix one of these days soon! Hope all is well! That's very cool… I'll have to make a mental note of that for when I visit Japan one day! 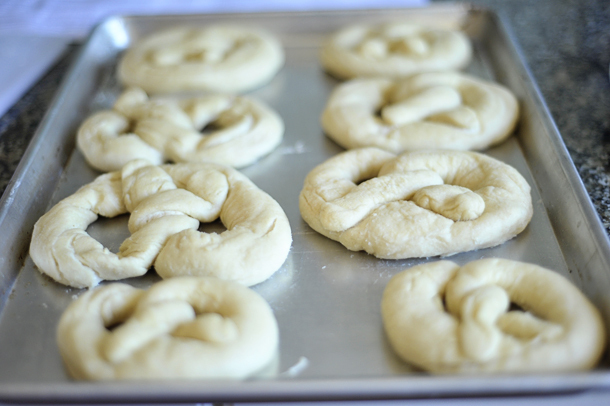 These look so good and easy in a way… after you get over the kneeding and raising part. Can't wait to try them. I love pretzels. Lye is different than baking soda and water, and it also is dangerous because it corrodes. 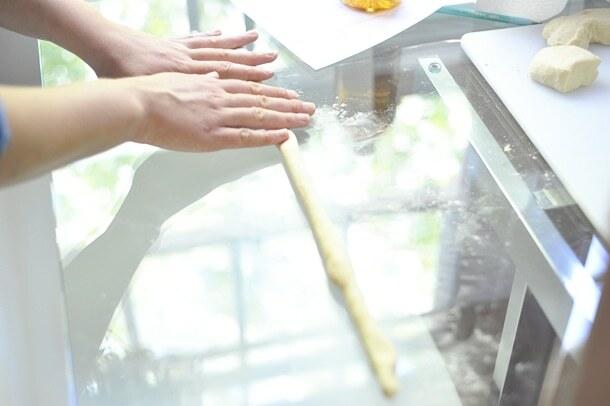 You can use it with gloves and safety goggles on, but since its purpose is to just brown the outside of the pretzels, a safer solution is the combination of baking soda and water. It all depends on how adventurous you're feeling. Can anything be substituted for the lard? Wow, I really like your blog! Great recipe here really good photos, they make me crave those pretzels! Thanks for sharing your recipes! BTW I am a huge fan of your work and movement, not only getting women to look at hunting and “food acquisition” differently but your recipes are amazing! 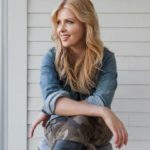 as a hunter from the Pacific Northwest I love reading about your adventures! Aw thanks for reading John! Glad to have you here to join the discussion. 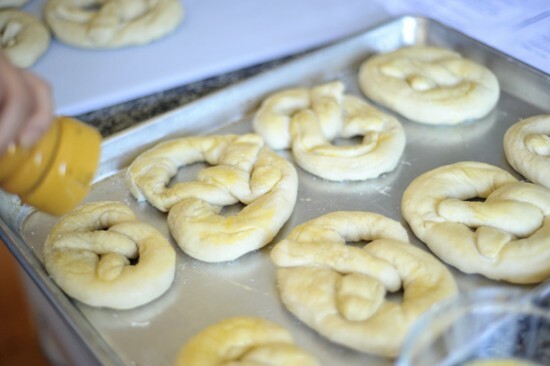 I know I’m a little late to the party here, but I just found this recipe online, and my son and i made them for german food day in his german class. They are freaking amazing! And not as hard as I thought they would be. Thanks so much for making me german food day hero!